I'm in the market for a subwoofer or, better yet, a pair. I've read with much interest theJman review on the Sub 1200. Very well done! Have been looking at PE and this forum to try to gather as much information as I could. I moved from a large listening space and still have the two DIY NHT 1251 subs and used there. However, my new listening room is much smaller (1950 cubic ft) and the cabinets are far too large for the room. So I began looking to build new ones. I was looking at assembling a cabinet and using the Dayton Audio RSS315HF-4 12" Reference HF Subwoofer 4 Ohm using a spa-250 watt amp and put it in a knock down cabinet they sell for $119.00. Small room and I don't listen at high levels so this should suit me well. Poking around PE and came across a couple of these Dayton 1200's that were open box specials and I could pick them up for the ridiculous price of $82 each... delivered! I couldn't resist so I ordered them today. , just the knockdown cabinet alone costs $35 more than these already assembled cabinets. The plan is to try them as dual subs just as they are and see for myself if they sound adequate. (again, only music) With proper placement and dual subs it probably will suit me just fine. IF it so happens I don't like them I have several options... one is I could pull the drivers and replace them with the new Dayton HF driver. Try that with the existing amp and see how it sounds. At lower listening levels may be just fine??? Then the option of replacing the amp with the new Dayton 250 watt amp. The last option would be to put the NHT 1251 in these cabinets and seal off the port. The cabinet is slightly under sized (2.7 cu. ft.) but should work. It would cost nothing to try this experiment and see how it sounds but is it a waste of time? I would imagine the NHT driver is a better unit. What say you??? Are these viable options? Any help is appreciated and I'm open for any suggestions. Again, I anticipate that these may sound just fine as they are when doubled up. Experimentation is what this is all about! If could be neither is viable I'm afraid. Subwoofers appear to be very simple products - consisting of but three components; driver, amp, cabinet - but the interaction between them has many variables. As such it's rare to successfully swap/alter any one component and have it work seamlessly, unless a lot of research is done beforehand. For example, what is the ideal cabinet volume for the NHT driver? You say "slightly" smaller, but what does that constitute in real terms? If the SUB-1200 is too large or small you will lose either efficiency or put the driver in harms way because it could then over-extend itself. In the case of the HF driver, what if the SUB-1200's rating of 250 watts is not enough power? The current driver in that subwoofer might be nominally rated for 8 ohms, while the HF may need 4 ohms instead. If that's the case the driver will attempt to draw more current then the amp can deliver, making it's life expectancy very short. Those are just a few areas of concern - there are other things to consider as well. Since your current NHT's are a DIY project I imagine you've gone through this drill when you built those, so you're probably familiar with this stuff already. Did you model those options you're considering yet? I'd be curious to see where the challenges might be. Some of them can be overcome with relative ease. For example, if the only problem you see on the model is an undersized enclosure you can add loose-fill stuffing to fool the driver into thinking the interior volume is larger than it really is. I had noticed in your photo of the 1200 driver that it was also 4 ohms. So I thought the 4 ohm NHT would be compatible in this regard. When I built the NHT sealed cabinets the optimum size was 3 cu.ft. There was some wiggle room. For deeper reach the box could be made larger or for tighter base make the box smaller. (I believe it was as low as 2.7 cu. ft.) I realize the 1200 boxes are under that number. The inside volume should be around 2.5. for the 1200 box. Close with some stuffing? Being smaller would put more strain on the amp in order to reach the same volume but since I don't play at high levels it might work??? At the time I bought them from Madisound they were all the rage. They have smallish magnets (38 oz.) and were described as being "floppy". They were dependant on the sealed enclosure to provide resistance. So my thought was a smaller box would lose the lower register but could be a tighter more musical sub. I really have no idea what made the NHT 1251 a rave subwoofer. I would imagine that today's speaker manufacturers have made advancements well beyond what NHT had to offer at the time. Is it possible the stock speaker in the 1200 performs as well if not better? or is the NHT 1251 still a well respected driver? The biggest realization for me was how, not only the room size but the composition of the walls changed the dynamics of the sound. My large listening room was the upper loft of a barn converted into a living space. Wood construction, sheet rock, big open space. Now, my room is much smaller (1950 cu. ft.) with (carpet)concrete floor and walls. This is a whole different dynamic. I borrowed a small inexpensive 150 watt 10" JBL sub from my daughter and playing with different speaker location have gotten a decent amount of base with a pretty tight sound. So it's more than likely the dual 12" Daytons will be fine like they are for just music but as a fun experiment would the NHT 1251 render an even improved musical performance??? The 'what if's' drive me nuts. Two 'open box' dayton 1200's were on sale so when I saw the price of $85 each I grabbed a couple and hoped for the best. Total, with shipping and a new customer coupon, landed me two of these for the tidy sum of only $165 delivered! My room is small (1950 cu. ft.) So I hooked one up first to see if it would be adequate by itself. Connection was using both connectors... L&R out to L&R in on sub. (one cable to mono works but greatly reduces output level.) Phase set at zero. I had done the 'subwoofer crawl' with another sub and the left front corner was by far the best location. So there it went. My anticipation had me thinking these are under powered so I had the volume up pretty high as well as the crossover. It turned out to have more than enough power and immediately needed to back things down. Once dialed in the sub sounded quite good. However, in this small room (with a slant ceiling) there are quite a few dead spots (nulls). However, center seat was well focused. I ended up backing the crossover down to 65hz. This got rid of boominess and allowed a bit more volume for the low end. This replaced the boomy sound with a more punchy, deeper and better blended sound. I played with this for a day. The sub has a down firing port. It stands on plastic feet leaving a very small space and it fires into my carpet as well. So,the only change I made was taking the sub off it's feet and laying it on it's side and let the down firing port fire open into the corner about 2 feet away. I prefer to use stereo so I have one Y connector coming from the 'left channel only' connected to BOTH L&R of the left sub and visa versa for the right side. This connection made a huge difference. The right side woofer was adjusted to match the left. Again I had to lower the levels little by little to get it blended well but the difference in fullness was immediately obvious. No more nulls and the richness of the sound was far better. Not bad with one but two subs is amazing. Wow! Some of the deeper base tracks could hit with real authority. At sound levels that could disturb the house next door. I was never near full on the volume knob and didn't need to go there. It was plenty loud. Acoustic base was rich and textured beautifully. Power was never an issue and I would imagine this would fill a somewhat larger room as well. Though I didn't try this set-up for home theatre but I'd imagine in this size room there would be more than enough low end to satisfy. For music only I am totally satisfied. The sound is powerful, full and rich and as Jman pointed out "buy two" really makes a huge difference in the over all quality of the sound and take the time to set them up correctly. The appearance is plain black vinyl like an HSU or SVS and look on par with them. The point is they don't look cheap nor do they sound cheap and I'm proud to display them as they look much more expensive than they are. At this price point it's hands down THE BEST money I ever spent in audio... period. Thanks again Jman... I'd never have bought these if it wasn't for your review! You're quite welcome. I'm glad they worked out so well for you. And thanks for posting your thoughts on how they perform! It's always beneficial when owners provide their first-hand experience. New to the forum and most HT stuff in general. Thanks in advance for any wisdom you have to share on this. I am building a HT (movies and gaming use only) in a room (27x12x9 with sloping ceilings in front and back but flat in the middle) and am trying to minimize costs if possible since the house is so far overbudget. For subwoofers, it seems that this Dayton Audio 12 inch is awesome for the $$, but given my room size I'm thinking of getting a second unit. What about mixing the Dayton SUB-1200 and SUB-1500 in the same room? My thought is that it would extend my lower frequency coverage with the 15", but is that actually going to make a difference? And will it make it much more difficult to get set up correctly so they blend seamlessly or would I just be better with matching SUB-1200's? Or, finally, would I be better off spending the combined amount on a single unit from a different brand? Good questions, unfortunately the answers to them all is - It depends. How well subs will blend in a room depends on many factors, most difficult to predict. Probably there would be no significant issues, assuming reasonably smooth raw response from both versions, the 15 in version might lower the bottom end of your range a little, no harm in trying - probably. What about mixing the Dayton SUB-1200 and SUB-1500 in the same room? My thought is that it would extend my lower frequency coverage with the 15", but is that actually going to make a difference? And will it make it much more difficult to get set up correctly so they blend seamlessly or would I just be better with matching SUB-1200's? If the 1200 is closer to you than the 1500 it might work, but barring that it's probably not a good idea. 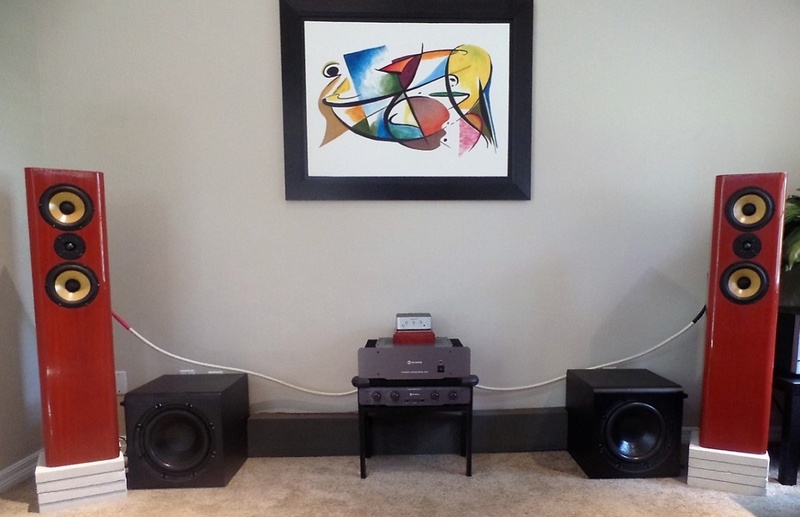 When you have subwoofers with different potentials the less capable one will always run out of steam before the other, and when that happens it has a tendency to drag down the overall sound quality as a result of distortion. If the smaller subwoofer is closer that can mitigate the problem due to the fact it doesn't have to work as hard for you to hear it, so in essence they will reach maximum output at similar volume levels. Or, finally, would I be better off spending the combined amount on a single unit from a different brand? Your room is about 3000 ft^3, which means you would have to spend about double the $350 (combined) that those two subs would cost. You may be able to get away with something like the Rythmik LV12R, but it wouldn't be a good idea to consider anything less than that.